There are several ways to obtain the Spanish passport. Depending on your concrete situation (nationality, years lived in Spain, etc. ), some of them will be more advisable than others. But there is a special situation that we must take into consideration. If you are a Sephardic Jew with Spanish origins or a descendant of one, then the Spanish nationality can be easily obtained. Would you like to learn how? In this post we will explain which are all the requirements to obtain the Sephardic Jew Citizenship in Spain. Get ready! With the intention to amend the actions carried out by Spain in 1492 that expelled Jews from the Iberian Peninsula, the Spanish Government approved on June of 2015 an act that granted the Spanish citizenship to the descendants of those who were kicked out. That law, which was set to last until October of 2018, was recently extended until October of 2019. Therefore, if you fulfil the necessary conditions to apply for the Sephardic Spanish passport, you must hurry up and avoid missing this bus! Certification from the President of the Jewish community from the birth or the residential area. Certification provided by the Federation of Jewish Communities in Spain. Certification from the Rabbinic authority, a document which must be legally recognized in the residence country. Regarding the first and the third points, the applicant can include a certification from the President of the Permanent Commission of the Jewish Community Federation in Spain that demonstrates the authority of the Rabbinic authority or the President of the Jewish Community. A copy of the original bylaws of the foreigner religious organization. Certification from the foreigner authority containing the names of those that have been designed legal representatives. Certification that demonstrates that the foreign authority is legally recognized in the country of origin. Certification emitted by the legal representative of the corresponding entity demonstrating that the Rabbi is in an operative status and currently complying with the established requirements set on the statutes. Ladino o “haketia” proof of use. Birth or marriage certificate, called “ketubah”, demonstrating the celebration in the Spanish tradition. A report that credits the belonging of the applicant surnames into the Sephardic lineage of Spanish origins. Any other circumstance or condition that demonstrates clearly the Sephardic Jew condition of Spanish origin. A certification (that must be emitted by a private institution or by a competent agent) of the culture and history of Spain. Proof of the belonging from the applicant in the protected Sephardic families of Spain, or of the direct ancestry of any Spanish citizen. Fulfilment of charitable, cultural or economic activities that go in favour of Spanish institutions or citizens. All those contributions to activities that have the aim to spread and preserve the Sephardic culture will also be sufficient. Any other circumstance that can demonstrate a clear belonging to Spain. Would you find the best proof that enables you to link your link with Spain but don’t know how? Let us help you! You just need to contact us HERE. Our team of immigration lawyers will be glad to help. We need to identify you: therefore a copy of your passport is the first thing you need to get. Also, the applicant must present a birth certificate, which must be legalized (apostilled) and translated into Spanish. As with all the other evidentiary documentation, all the foreign documents to be presented must be translated by an official translator process called transalting for legal equivalence. Any other document that attests to your identity will be valid. The first exam you will need to pass, in order to demonstrate your basic knowledge of Spanish, is the DELE. Getting an A2 or plus level is required in order to grant the passport. But, wait a moment! All the native Spanish speaking countries are exempt from taking this exam. CCSE exam. This is the exam that lets you prove your knowledge of the Spanish Constitution and the cultural and social reality in the country. All of this exams will be evaluated by the Cervantes Institute. 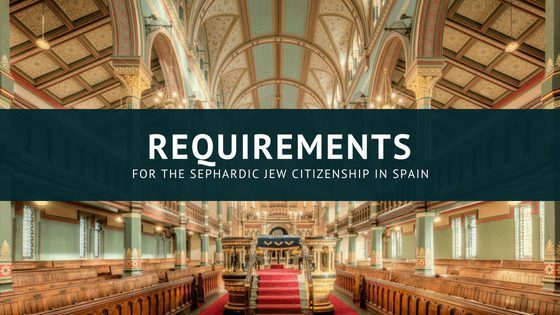 Do you have doubts regarding any of the requirements needed to get the Sephardic Jew Spanish Citizenship? Let us know in the comment section down below! I am interested in obtaining additional information Spanish Sephardic Passport program. We are located in Colorado USA. We can trace our lineage back to Spain in 1492. But there are some difficulties in obtaining written documentation. So before we begin this process I’d like to get some additional guidance. Can you provide me with an outline of how to proceed and what type of services your firm can provide. Hi Robert. We would appreciate if you could send us an email at info@balcellsgroup.com detailing your situation so we can analyze your concrete case and provide you with legal assistance. Thank you very much! Hi,my name is Simon Chacon, and I would like to apply, I live in California now, but both my parents lived in South America. I just did the DNA test and it seem I might be Spanish Sephardic Jew. Can you please tell me how to star this process? In order to start managing the application process, would you mind sending us an email to info@balcellsgroup.com so we can start as soon as possible? Thank you very much for reaching out to us, we will be glad to help with your Spanish nationality. The law was extended just until October, therefore after that month it won’t be possible, that is why we suggest you to start the process as soon as possible (we can help you with that). I received my DNA results recently. 23 & me could only go back with my family to WW1. I believe some of my heritage is Saphartic Jew but the results came back as 100% Ashkenazi. We will be visiting Spain in May & would like to persue Jewish Spain citizenship. How do I start the process now & hopefully being there where & how do I speak to the right authorities to accomplish the necessary details? If you are visiting Spain in May, we would be really happy to have you at our office so you can talk with the specialized immigration lawyer about how to start the whole process and we will answer all your doubts. If you send us an email to info@balcellsgroup.com we can arrange a specific date to have our meeting. Whether you are living in the US or not, if you are a Sephardic Jew you can apply for the Spanish nationality anyway. But you only have until October of this year to do so, so we advise you to start as soon as possible. If you send us an email to info@balcellsgroup.com, we can start managing the whole procedure for you as soon as possible! If one of my family members qualifies could other close family members (parent, child) also gain citizenship as a relative? If one of your relatives qualifies and gets the permit, you can apply for the residency permit as a family member of a European Union citizen. Hope you enjoyed reading the post at least! I received my results from MyHeritiage and it states I am 18% Sephardic Jewish. Is that enough as proof? In that case, we would really appreciate if you could send us an email at info@balcellsgroup.com so we can start now helping you get your Spanish passport.